The Rachell Allen Intellectual Property (IP) Rights consist of a body of knowledge and proprietary educational modules created by Prof. Rachell Allen, her chief instructors and other stakeholders. 1. Offer access to world-class quality courses and a vast amount of relevant information ready to be used in conducting NCLEX Programs including NCLEX eLearning solutions. 2. Entitle you to use the Program Materials, online learning modules system and other related services. 3. Provide training for your instructors or facilitators. 1. 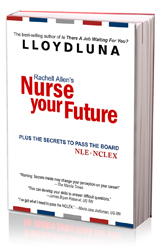 Reduces company time, high cost of developing world-class, high-quality NCLEX Review Programs and eLearning Courses. 2. Provides access to long-term NCLEX learning solutions, program updates and an international standard of education. 3. Avoids losses in production time, productivity, high instructor training costs and other expenses as those incurred in developing and setting up new Review Classes and eLearning programs from scratch. Upon fulfilling the obligations set forth in the Rachell Allen IPR License Agreement, you will be provided with the Rachell Allen Review Programs, the eLearning System and the ability to offer the Rachell Allen courses online.